Romesh Ranganathan has announced a 2016 tour, Irrational, and will play one night in Glasgow’s Theatre Royal later this year. Romesh Ranganathan has announced a 2016 tour, Irrational, and will play Glasgow’s Theatre Royal later this year on the 7th of December 2016. 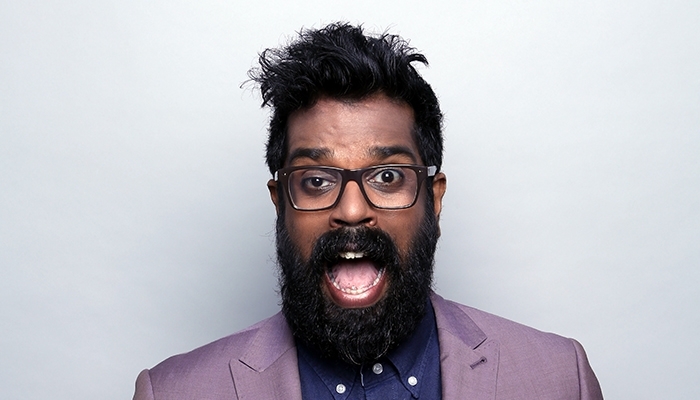 Romesh Ranganathan has announced a 2016 tour, Irrational. It is the show he had intended to perform at 2015’s Edinburgh Fringe, but was cancelled as he travelled to Sri Lanka to trace his family routes for the six-part BBC Three series Asian Provocateur. Romesh Ranganathan’s impact on the comedy circuit since his debut in 2010 has seen him quickly make a name for himself. The last two years have been incredible for Ranganathan with his critically acclaimed Edinburgh Festival show, ‘Rom Wasn’t Built In A Day’ being nominated for the prestigious Edinburgh Fosters Best Show Award in August 2014. This was only 12 months after his festival debut ‘Rom Com’ being nominated for the coveted ‘Best Newcomer Award 2013’. Tickets are now on sale. Get yours quick!